If more PowerPoint presentations were created using the tips below, these presentations would have likely avoided disastrous results! Whether it be in a high school classroom, college lecture hall, conference room, or large presentation, at some point in our lives we have all been subject to a brutally boring, painful-to-watch lecture accompanied by an awful PowerPoint. While public speaking and presentation design may not be everyone’s forte, we’re here to give a few helpful tips to help make your presentation a success. If the presenter is the driver of a presentation, the accompanying visual aids are almost certainly the vehicle. The presenter and the aids must compliment each other in order to ensure an effective presentation. Unfortunately, the text-filled slide approach is the most common PowerPoint method. As anyone who has sat through one of these presentations would know, they are far from effective. An effective presentation contains content that is arranged in the most efficient manner without superfluous decoration. Essentially, presentations should be simple, balanced, and appealing to the eye. Most importantly, presentations and their corresponding visual aids should focus on a “whole-brained” approach. Good presenters will make a conscious effort to focus on the audience’s left-brain and right-brain sensibilities. Simplicity – Reduce ideas to their essential meaning. You want to answer, “What is the key point?” and “Why does it matter?” as concisely as possible. Remember, if everything is important, then nothing is important. Unexpectedness – Take people by surprise. A person’s curiosity can be a powerful tool when giving a presentation. Make your audience aware that there is a gap in their knowledge and spend your presentation taking them on an excursion to fill in those gaps. Concreteness – Being vague and ambiguous are not in the presenter’s best interests here. Use simple language that your audience will be able to comprehend. In the case of presenting, it is better to be clear and simple than to be abstract and profound. Credibility – This should be self-explanatory. Most of us will not be a renowned leader in our field so we have to use other things to establish our credibility. Use numbers, data, and statements from leaders to establish your own credibility. You want to come across as an expert on your topic. Emotion – Build an emotional connection with your audience. You need them to “feel” your topic. Use pictures to build a more emotional connection to the idea. Sure, you could spend lots of time discussing statistics and the effects of smoking on a human’s lungs, but truer connection can be easily established by showing your audience what you are speaking of. Stories – Tell stories. Plain and simple. It is human nature. It establishes a relationship with your audience as well as a since of credibility. Stories are entertaining and engaging. We teach and we learn more effectively through the stories that we share. Finally, stay away from the dreaded “deck of slides” approach. Don’t be afraid to deviate. Create an effective handout that has all of your important points on it. This allows you the flexibility to go with the flow of your presentation and not be constrained by the need to go over every bit of information that you have recorded. Remember, your presentation should be supplemental, not the main attraction. As I mentioned previously, if the presenter is the driver of a presentation, then the vehicle s the presentation itself. Using these tips, you will almost certainly transform that old, beat-up Datsun of a presentation into the Mercedes it deserves to be. 1. Be cognizant of your signal-to-noise ratio. Signal-to-noise refers to the ratio of relevant information to irrelevant information on a slide. It is presenter’s goal to limit the amount of irrelevant information (whether it be pictures, gaudy graphic design, or extraneous text) in order to not distract the viewer from the main point of the slide. This can be made possible by eliminating inappropriate charts, ambiguous labels and icons, and lines, shapes, and symbols that don’t have a key role in the main message. 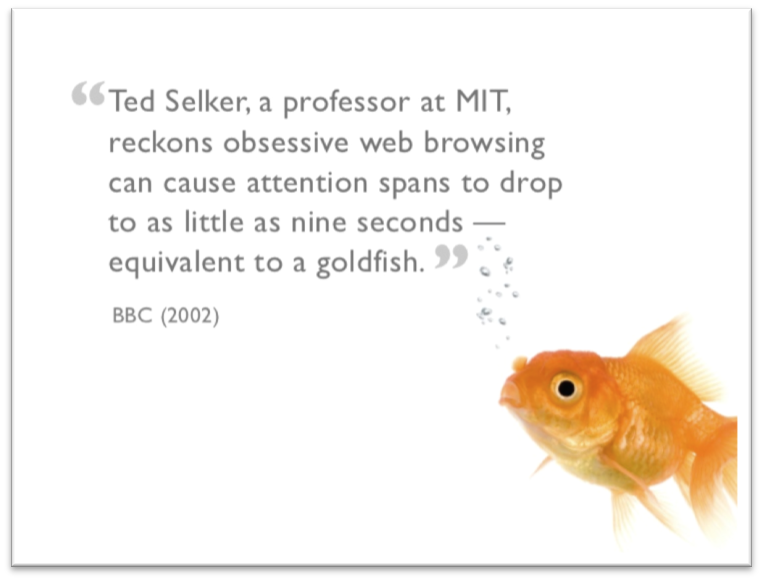 Don’t be distracted by fancy gimmicks offered by PowerPoint and Keynote. For example, a 3D chart may look nice, but it may actually be more distracting than its 2D cousin. The photo on the left is a good example of a photo with a signal-to-noise ratio that is far too high. Everything from the photo in the background to the 3D bars is just too distracting. 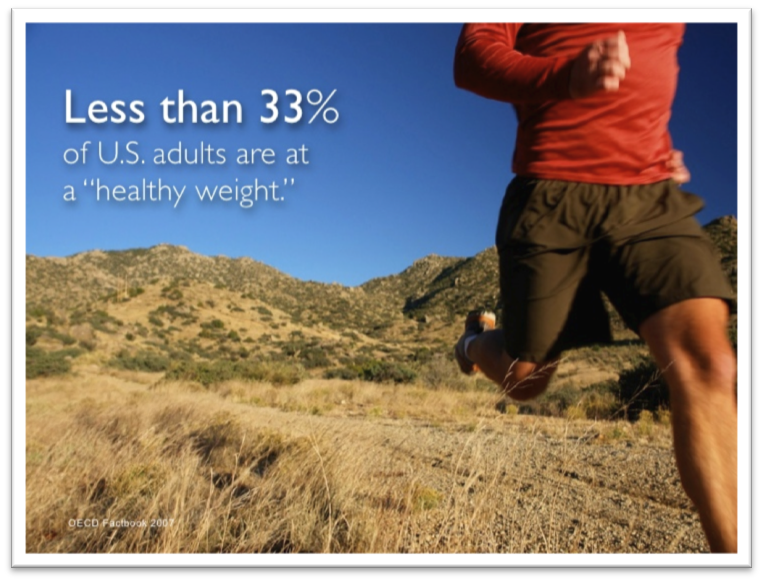 The example on the right demonstrates how a simplistic approach may actually draw attention to your slide. 2. Pictures are more memorable than words. According to Universal Principles of Design, “Use the picture superiority effect to improve the recognition and recall of key information. Use pictures and words together, and ensure that they reinforce the same information for optimal effect.” Simply put, pictures help to reinforce key ideas and concepts. Ask yourself this question: “What written information can I replace with visual information?” Remember, the more visual information you provide, the more likely your message is to stick with your audience. Take a look at this before and after. Which slide appeals to you more? 3. More is not always better. 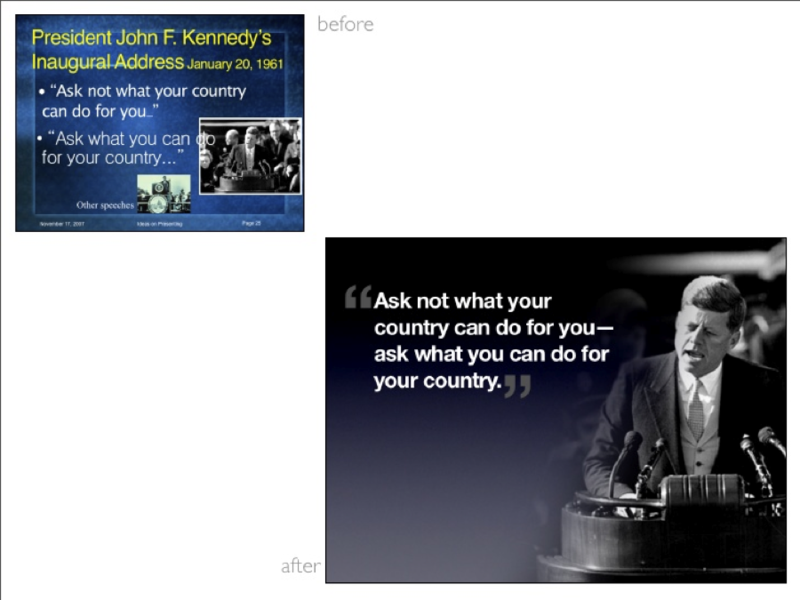 Effective use of whitespace on your slides helps to create a certain clarity in your presentation. Something as simple as adding color can make slides “busy” and therefore distracting. 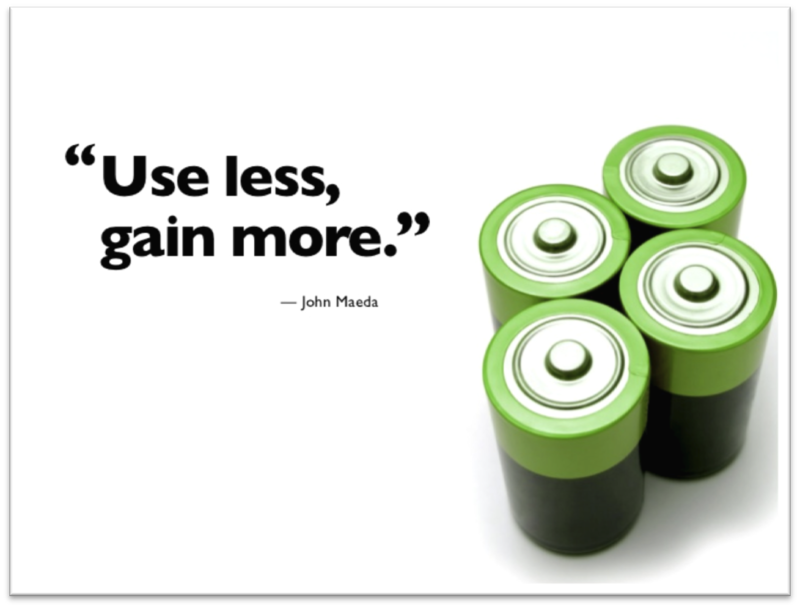 Notice how the effective use of white space really makes the color of the batteries and the quote pop to the audience. The slide is simple and concrete. The message is clear and the audience knows exactly what to take away. 4. Don’t center anything. There are several times in life when it is important to find your center. 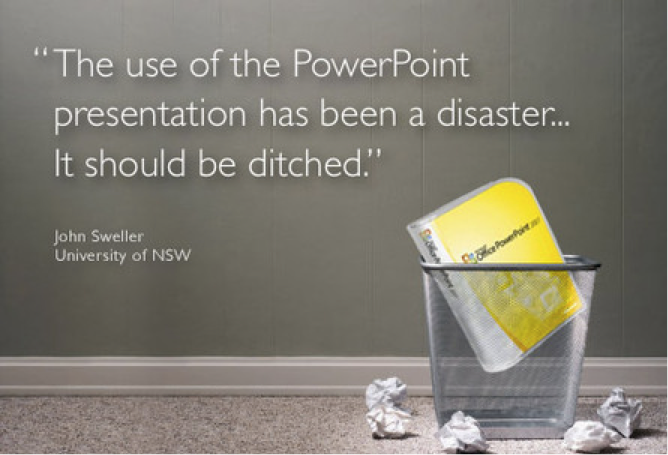 However, when you are creating a PowerPoint or Keynote presentation, it is not one of them. For years, photographers have known and utilized the “Rule of Thirds” as a way to make their photography more appealing to the viewer. By creating a 3×3 grid on your PowerPoint slide; you will create nine points in which the placement of text or images will more fully engage your audience. Notice how no element in these two slides is truly centered. The truth is, when giving a presentation, being in the center is predictable and boring. By pulling drawing the viewer’s eyes slightly off center, you allow more landscape which creates an overall more aesthetically appealing result.